It is close to midnight at the home of C.T. Ravi in Chikkamagaluru. 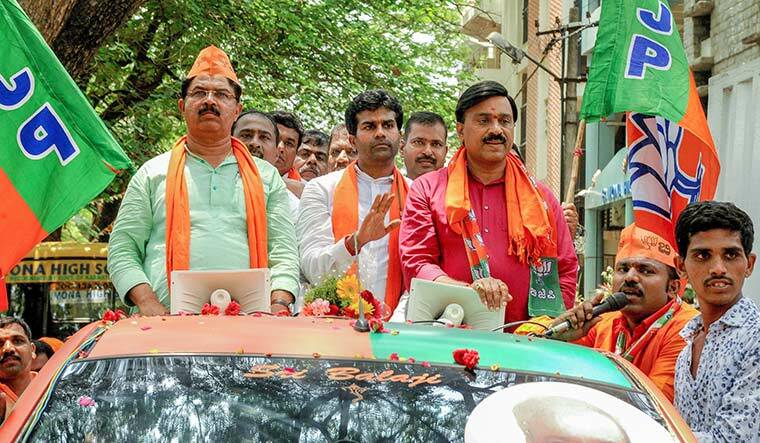 The BJP stalwart is fighting his fourth election to the Karnataka assembly. The stormy petrel, who has a penchant for controversies, is brainstorming with a group of Tamil Nadu party workers led by former parliamentarian C. Narasimhan. Ravi is giving out details of migrant workers in the constituency, which has a lot of coffee plantations. Narasimhan has prepared pamphlets in Tamil for the benefit of the team, which will be distributed in the plantations. In Mayakonda, 70km away from Chikkamagaluru, another BJP candidate, B. Lingappa, is dealing with a team of Telugu-speaking workers. Further away in Hospet, the hub of the mining world, the team working for Congress candidate Anand Singh is briefing campaigners from West Bengal and Odisha, who would reach out to migrant workers from the eastern states who have registered as voters. In Badami, where Chief Minister Siddaramaiah is tangled in a triangular contest, the Janata Dal (Secular) candidate Hanumanthappa Mavinmarad’s aide, Santhosh, is busy with a long list of names and mobile numbers, calling up young men and women of the weavers’ community, who have migrated to Bengaluru. Santhosh pitches a word for Mavinmarad and asks them to take leave on May 12 to come and vote. He reminds them that they should make bus or train reservations as the weekend rush out of Bengaluru will be heavy. Similar scenes are happening in all the 224 constituencies of Karnataka, as the warriors of the three major parties are working hard on the ground to win. But, the field marshals—Narendra Modi and Amit Shah of the BJP, Rahul Gandhi and Siddaramaiah of the Congress, and H.D. Kumaraswamy of the Janata Dal (Secular)—have taken to the skies, hopping from one corner of the state to another in helicopters. But, H.D. Deve Gowda, the grand old man of Karnataka politics, prefers to travel by road. Karnataka is astir with huge excitement, and the turnout in rural areas is expected to go high despite the scorching heat, as the monsoon is a few weeks away. Revenge and redemption are the themes that characterise the campaigns, as there has been a large-scale switching of parties by candidates and ticket aspirants. The most targeted man is Siddaramaiah, not only because of his aggressive governance but also his political tactics. Some are old feuds and a few are new. Kumaraswamy wants to teach Siddaramaiah, who left the Janata Dal(Secular) 14 years ago, a lesson. He has also asked his son Nikhil Gowda to campaign against seven turncoats who were poached by Siddaramaiah two years ago and are now contesting for the Congress. The smart seven, as they are described by their supporters, have now started out with CDs exposing the entire Deve Gowda clan in politics. Deve Gowda’s sons, H. D. Revanna and Kumaraswamy are contesting, grandsons Nikhil and Prajwal Revanna are campaigning, and daughters-in-law Anita Kumaraswamy and Bhavani Revanna are the forces behind their husbands. 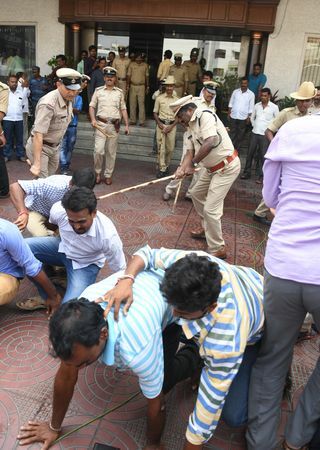 An equally bitter enmity is shown by jailed mining baron G. Janardhan Reddy, who wield enormous influence in the BJP in the state, despite being shunned by the high command. He has got tickets for his two brothers, a nephew and half-a-dozen supporters, as he has pledged his scheming brain and considerable resources to humble Siddaramaiah, who had campaigned by a padyatra to get Reddy booked for violation of mining and other laws. Siddaramaiah is targeting the candidates of the Reddy parivar. Revenge and redemption are the themes that characterise the campaigns, as there has been a large-scale switching of parties by candidates and ticket aspirants. The BJP’s weakness in southern Karnataka can prove to be a major disability unless Prime Minister Narendra Modi can create a wave. There are repentant BJP candidates who had sided with B.S. Yeddyurappa and tribal leader B. Sriramulu in the last assembly elections when a three way split had happened in the BJP. These candidates are seeking forgiveness and pledging total loyalty to Modi and Shah. Yeddyurappa has been shaken by the denial of ticket to his son B.Y. Vijayendra to take on Siddaramaiah’s son, Yathindra. There is a joke in the political circle that the most active party in Karnataka is the income tax party. The state has seen an unprecedented number of raids by the Income Tax Department on liquor and public works contractors who support the Congress. The excise portfolio has been held by Siddaramaiah and the public works is with his trusted aide, H. C. Mahadevappa. The Congress is complaining misuse of official machinery and browbeating by the Union government. The BJP argues that the raids show the massive use of black money, and, also, Modi’s determination to root out political corruption. But, the Congress questions why none of the moneybags supporting the BJP were raided, and argues that no money has been found. The party pronounces the raids as an attempt from the BJP to tarnish the image of Siddaramaiah. It is not just Income Tax officials, but there is a heavy presence of other Central agencies like the Enforcement Directorate, too, as there is suspicion about large cash hoards. Mobile luggage scanners have been installed on national and state highways at close proximity to catch those transporting cash. Most of the candidates have been chosen because they belong to a dominant caste or religion, and also have a huge financial base. But, there are exceptions. A prominent one is Y.S.V. Datta, a teacher-turned-politician of the Janata Dal (Secular), who is known for his articulation in the assembly on people’s issues. In the rural constituency of Kadur, Datta’s caste accounts for just a few thousand voters. Nor does it have a big population of Vokkaligas, who are the main source of numbers for Datta’s party. But, Datta claims that he has been able to get the trust of all castes, and his campaign is as simple as his lifestyle. There are also candidates who put hopes in the intensive development activities of their last term as legislators, utilising every Central and state scheme for their constituencies. But, a large number of candidates depend on caste, religion, political and resource factors for their victory. Grabbing votes: H.D. Kumaraswamy during election campaign. In terms of ideology, Siddaramaiah’s style of development with socialistic characters confronts the assertion of the BJP’s strong administration focused on delivery of projects, and Kumaraswamy’s empathetic and informal style of governance. It is a tough choice, because it is a triangular contest in many places. The Congress is in contention in all the constituencies except one—it is supporting a Swaraj Abhiyan candidate in Melkote in Mandya. The BJP is fighting in five out of the six regions strongly, but it is weak in southern districts. Janata Dal (Secular), on the other hand, poses a tough challenge to the Congress in the southern districts, and is influential in Bengaluru city and some central Karnataka districts. It is also present in a few constituencies of the coastal belt and northern districts. This uneven presence of the BJP and Janata Dal (Secular) poses a peculiar problem for all parties in their quests for the magical number of 113 in the new assembly. If there is uniform split of anti-Congress votes between the BJP and Janata Dal (Secular), then the Congress has a better chance to sweep. Similarly, the BJP’s weakness in southern Karnataka can prove to be a major disability unless Modi can create a wave. The last time Karnataka had a wave was in 1989, when the congress swept out both its rivals. Kumaraswamy is miffed that the best projection given for him is of a kingmaker who can become king by hard bargaining in a hung assembly, rather than being elected as chief minister with full majority. The only man who can take the Congress to the target is Siddaramaiah, and he is also a target for toppling. That is why all the parties are using every language—even the Kannada-proud Siddaramaiah regretted not knowing Marathi, when he tried to woo voters in a Marathi-dominated border constituency in Belgaum.